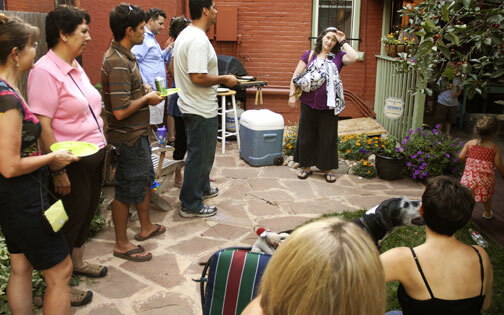 Baby showers are a terrific way to usher a new baby (or bigger kid) into a family. Traditionally intended to help supply the nursery, baby showers today are less focused on onesies, and more focused on making a new little one feel welcome. Adoptive family showers may be a little trickier to plan than a traditional baby shower. Without a clear due date in sight, it can be a little challenging to select a date, rent a space, or issue “save the date” cards. Although some adoptive families welcome a shower before they know who their new tot might be, for others, a house full of nursery items (or skateboards and bunk beds) may be too much to deal with during the wait. In my family, we had two different types of showers. Our first adoption was a domestic placement. We were called about our son on a Wednesday night and met him on Monday morning. Our friends were overjoyed for us and planned showers after Elliott’s arrival. At both, Elliott was the (sleeping) star of the show. He modeled new clothing (okay, we sort of draped it on his sleeping body), cuddled up with new blankets, and opened a sleepy eye to gaze at a new book or toy we were excited to show him. It was a great way to show him off, celebrate his arrival, and receive the most adorable socks ever. Our showers for Astrid Meklit were held a few weeks after our referral, but before we brought her home. At each, we opened the gifts, modeled the clothing (my husband looks smashing in a sun hat), cuddled the blankets, etc. and again, the baby (who was then living 7984 miles away) was still the star of the show. Her referral pictures were passed around and we all looked forward to the day she would join our family. Although a little hesitant to celebrate before our court date, I’m glad we had the chance to celebrate with our friends. It made the thought of the baby 7,984 miles away that much more real. 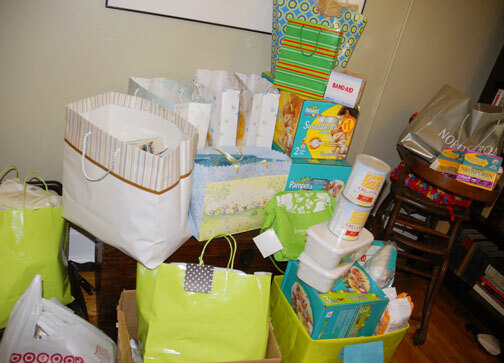 Recently, I read of a new mini-trend in adoptive baby showers. It seems that friends and family are so eager to celebrate, showers before referrals have become popular. At these showers, there is an emphasis on buying the types of items that are universally appreciated (diapers and wipes, blankets, etc) but not necessarily for the new family. Often these showers are held to benefit an orphanage or agency in the child’s country of origin. We didn’t have a separate shower, but everyone brought a donation for us to take to Ethiopia, as well as a gift (or gifts) for our darling girl. By the time we were finished with the various fetes, we had a full suitcase of books for Ethiopia Reads and all sorts of over-the-counter medications and ointments for Toukoul. If you are waiting to adopt, be clear about the type of shower you’d like to have (NOT in a Bridezilla way) but in a manner that conveys what you’re comfortable with, when your loved ones bring it up (and they will, oh how they will. Our surrogate grandma-in-waiting, Anne, was so excited about planning Astrid Meklit’s shower, she called or emailed almost every day to see if we had received our referral. We didn’t see her or talk to her for almost a week before we received Astrid Meklit’s referral, and it felt odd to call so she could make plans to celebrate us). If you are planning a shower for an adoptive family, make sure to ask what they’d like to do, and consider planning a pre-shower for donations (either physical or financial). Don’t forget to plan a welcome event for older children. The family may want to have a shower before they come home, or a get-to-know-you event once the big kid arrives, but either way, a party to celebrate the arrival of new child (no matter the age) is a great idea. There’s no right way to plan a shower. Whether ladies only or for couples, months before the arrival or months after, a party to say, “hooray–you have more people in your family!” is always welcome, always treasured. Thank you Kelly from Colorado for hosting your baby shower to benefit Ethiopian Orphan Relief, Inc.’s Building Project for Children’s Heaven! Your gift will help many orphaned teenage girls make the transition to adulthood safely. Thank you for doing some “donation shopping” for the EOR webstore while in Addis as well! Congratulations to your family on your beautiful baby girl. Thank you to Katie in Colorado who asked for donations to EOR’s Building Project for Children’s Heaven in lieu of gifts at her baby shower! Katie leaves at the end of the month to pick up her beautiful 5 month old daughter Helina. Katie will be visiting Children’s Heaven’s current facility (which the rent has been raised on and they can no longer afford) while in Ethiopia and will be doing some shopping with Children’s Heaven’s Director Hanna for the EOR Denver Art Show and Auction. If you’d like to have your baby shower be a fundraiser for one of EOR’s Projects, please contact us at info@ethiopianorphanrelief.org. If you are interested in shopping for Ethiopian goods while in Ethiopia to donate to the EOR Denver Art Show and Auction or the EOR Web Store, please contact us at info@ethiopianorphanrelief.org.